Due to internet issues yesterday, I wasn’t able to finish my Christmas eve post so here is the rest! I spent the evening of December 24th in a very non-traditional manner. Other than visiting the Anglican church that now sat on the site of the former slave market, I did not even focus on the fact that it was Christmas eve. Instead I had arranged with one of the nice men that I met to take me on an evening excursion around Stone Town. And I have to admit that this nocturnal tour was so much better than my guided tour during the day. Khalifa (yes, I could call him Whiz if I wanted to!) first took me to the Serena which is a luxury inn located directly on the waterfront. It has a beautiful terrace that you can walk along or sit on and enjoy the view. There are also wonderful exotic trees growing on the terrace from which Khalifa plucked a very fragrant bloom for me. This began another trend that I continued during my stay…for the next four days I always had a flower to wear in my hair. Upon leaving the Inn, of course who did I run into literally! My professional guide who of course was more than a little disconcerted to see me out and about taking in the sights. I figured he knew then that other than the two very touristy outings that I had pre-booked through him that he would not be getting any other money out of me. I am smart girl and if I had friends willing to take me places at no cost than why should I pay a boring guide to bore me? Next on our night out, Khalifa took me to the night market and I truly felt like a kid in a candy store. There is very little street lighting in Africa, often only in the biggest and most cosmopolitan of cities. Stone Town is no different. Yet the night market, as is the market in the evening at Forodhani Gardens, was awash with a golden glow from oil and electric lamps, candles and even small fires. My father would be proud of me! I ate my way through the entire market trying every exotic fruit or food offered to me. Khalifa was the perfect guide! I got to drink coconut straight out of the shell and then the seller scooped the coconut out for me to munch on after I had finished the liquid. I literally followed Khalifa from one stall to another talking to the sellers, asking a multitude of questions and simply laughing and enjoying myself as I got to try exotic fruit after fruit. It truly will be a memory that I will keep with me for the rest of my life. Unlike the frenzy of the day market, everyone is more relaxed and everyone is outside. Sellers are either at carts or sitting on blankets on the sidewalk. Everyone is laughing and enjoying themselves even though it is necessary that they sell all of their goods so they can provide for their families. And everyone that we stopped to buy from and talk to genuinely engaged in conversation with me. I was not made to feel like a tourist but welcomed as someone who wanted to learn and experience this side of local life. Following about an hour and half of roaming the market and gorging on healthy fruit and such, I noted that we were directly across from the bus rank. Now for those of you who have been following my blog, you understand how I love the chaos of a noisy busy bus rank so do you think that I could resist the one in Stone Town. Of course not! Khalifa truly was a good man! Seeing the excitement in my face at this discovery he asked if I wanted to go on one of the Dala Dala’s to visit a village on the outskirts of the town. I couldn’t get across the street fast enough. But first Khalifa had to explain to me that he might have to take my hand in order to ensure that we weren’t separated in the chaos. Assuring him that I was okay with that (thanks to Lawrence, who is also a man from East Africa I am now completely comfortable with men taking my hand) we set off to board a Dala Dala. A dala dala is a mini bus that is privately owned and operated. There is no public bus system so the routes and vehicles are operated by men looking to make a living. They have a driver and a conductor who takes payments, thumps on the side of the vehicle to get it to stop for a pick up or to keep it moving. This is a picture of one that I took in the day time. It is extremely hard to get a picture of them as they are constantly on the move. Needless to say that I was thrilled to back on one, the first time in over twenty years! It took a couple of tries before Khalifa found the one that he was looking for that would transport us to the village of Bububu. This is a small village about 10 kms from Stone Town and is home to industrial factories along beaches. The ride was exhilarating. Dala dalas move quickly and driving in Tanzania is even more insane than Botswana. A barely two lane road often is turned into a three or four lane highway as there is constant passing and overtaking of the various and sundry modes of transportation. It is often better to watch where you are going but rather focus on the scenery running by you so then you are not seeing all of what we in North America would call near misses. Arriving in Bububu – I just love saying that ! 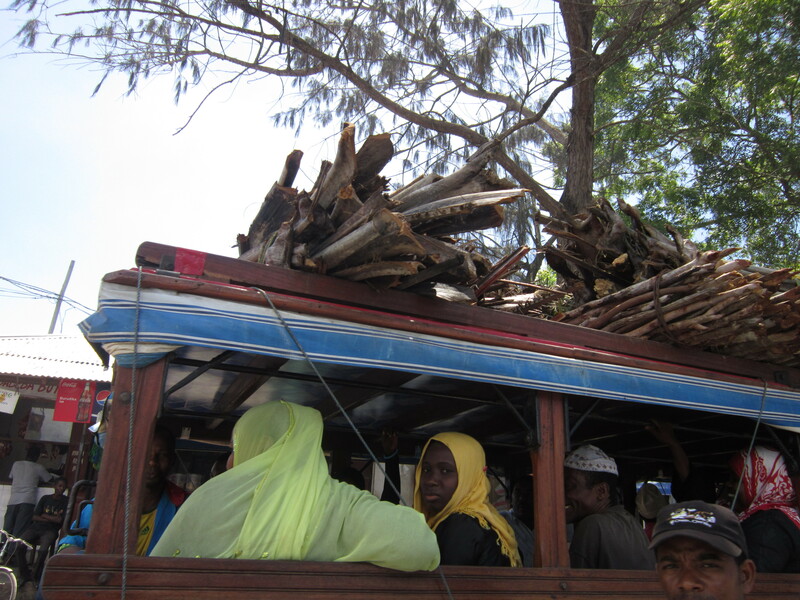 We got off the Dala Dala to wait for one returning to Stone Town. I was soon surrounded by several young women eager to talk to me. As it turned out there was a Dala Dala ready to make the return trip so I sadly said goodbye to the young ladies and headed for the waiting vehicle. The girls sadly called after me and by the time I was up to the Dala Dala the driver was having a conversation with Khalifa in Swahili. Before I could get into the vehicle Khalifa told me that I could go back and visit with the girls for a few minutes as the driver was more than willing to wait for me. So I got to spend about 10 minutes chatting with these lovely young girls answering all of their questions and letting them touch my hair, face and clothes. It is so rare that any tourists ever stop to actually speak to them that their curiosity was finally being sated. Soon I was back in the Dala Dala speeding along. The driver had given Khalifa and I, the prime front seats beside him. Not necessarily the safest seats but it meant that I would not have to jump in and out of the vehicle as people got on and off. Sitting in the centre next to the driver I had to be careful that my knee didn’t accidentally interfere with his changing gears. But the seat did give me prime viewing of sights as we whizzed by. Suddenly I sucked in my breath as there was a kitty on the road. There are cats everywhere in Stone Town but no dogs. I could not bear to watch this one get run over by us, however, the driver quickly slowed down and skilfully manoeuvred around the kitty allowing to safely make it to the side of the road. I couldn’t help myself and beamed a brilliant smile at the driver who quickly returned it. When I said to Khalifa that that had certainly made my night the driver must have understood as he smiled and said thank you! Returned to the bus rank I clambered down out of the dala dala and turned to the driver to say thank you in Swahili and he in turned thanked me in English. After a brief conversation with Khalifa, who told me that the driver had invited to ride with him again tomorrow if I wanted to see the route in daylight. I kindly declined as I already had a tour booked for the next day. So I said goodnight and walked back to my hotel with Khalifa, who after safely seeing me to my hotel said goodnight. Before entering the front lobby I stopped to listen to the sounds of live music coming once again from the Old Fort and couldn’t resist the lure. So before going to bed I went to the Old Fort and danced for an hour. The lure was simply to strong to resist! Now that was a Christmas Eve to remember.